We Manufacture this PEARL NECKLACE SET on make to order basis choice of metal polish & colour of stones available. reva INC. has lavishly flourished since its inception in the year 2005. 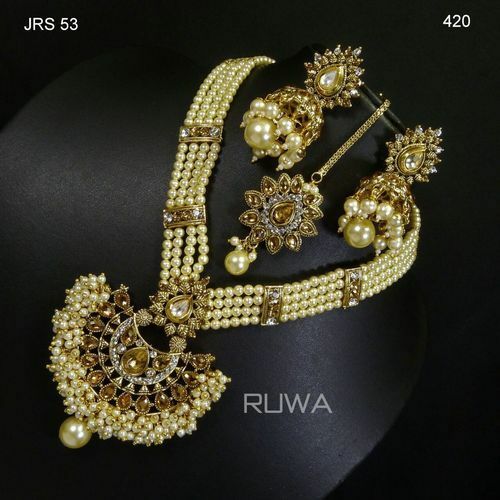 With the support and guidance of our honorable CEO Mr. Vimish Mehta, our company is also counted among the most well reputed wholesale trading, exporting and supplying of American Diamond Necklace Sets, Pendant Sets, Ladies Earrings, Ladies Ring, Ladies Bangles, Ladies Payal, Designer Chuda Sets, Bridal Sets and Ladies Kada in India. We have also specialized in the dealing of impeccable Imitation Diamond Rings that match the trends prevailing in the market. Customers are also facilitated with the availability of the Wholesale Imitation Jewelry at the most affordable prices. With the constant feedback from the customers, we have provided the same to the vendors whose craftsmen have carved the latest designs that are as per the latest trends prevailing in the market. These designs also match the ever-changing demands of the market and type of occasion.